note: each critical mass there is a group in the u district that leaves red square at 5pm and bikes to westlake center. anyone who wants to come on this pre-ride is welcome. We depend on everyone out there to help let people know about Critical Mass, be sure and try to bring a few friends and pass around some flyers. 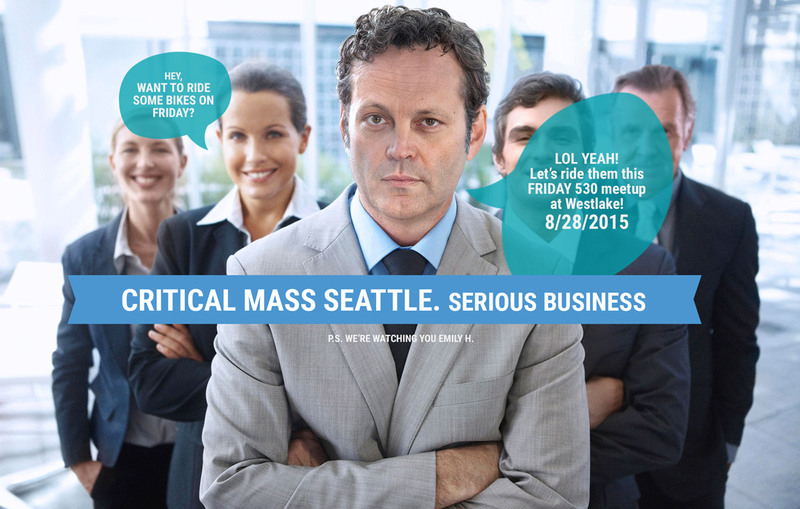 tell your friends, coworkers, family, or complete strangers about critical mass! we have flyers to print and plaster up or leave on fellow cyclists' bikes. on the last friday of every month in over 100 cities around the world cyclists congregate together to ride in demonstration and in celebration. critical mass has no leaders and no set agenda and people come together to ride for many different reasons. to assert cyclists right to the road, to promote bikes as a fun, healthy, viable alternative to cars, to build a greater sense of community, to get more folks on bikes, or simply to celebrate bike love and ride in solidarity with other like minded individuals and have some fun! overall the ride is what you make it! send us an email with the links to your photos and which ride they were taken on and we will get them linked up for everyone to see.